On 6th June 2014, the European Alliance for a Democratic, Social and Sustainable European semester held a Capacity Building workshop for 35 Alliance members in Brussels. The workshop was primarily aimed at national members of the Alliance, including the 3 pilot alliances in Bulgaria, Denmark and Ireland, but also at representatives from Brussels-based Alliance members. Read the full report! The workshop was meant to strengthen members’ knowledge of Europe 2020 and the European Semester, increasing the effectiveness of their engagement, boosting their capacity to build effective alliances cross-sectorally, particularly at the national level, and improving the involvement and ownership of the Semester Alliance. The day was highly interactive, involving presentations and discussions, with inputs from the European Commission, as well as practical workshops, featuring exchanges, group exercises, and learning on national engagement and cross-sectoral working. Increase the involvement and ownership in the Semester Alliance. The European Alliance for a Democratic, Social and Sustainable European Semester is a broad coalition bringing together 16 major European civil society organisations and trade unions, representing thousands of member organisations at the European, national and local levels. The Alliance aims to support progress towards a more democratic, social, and sustainable Europe 2020 Strategy. 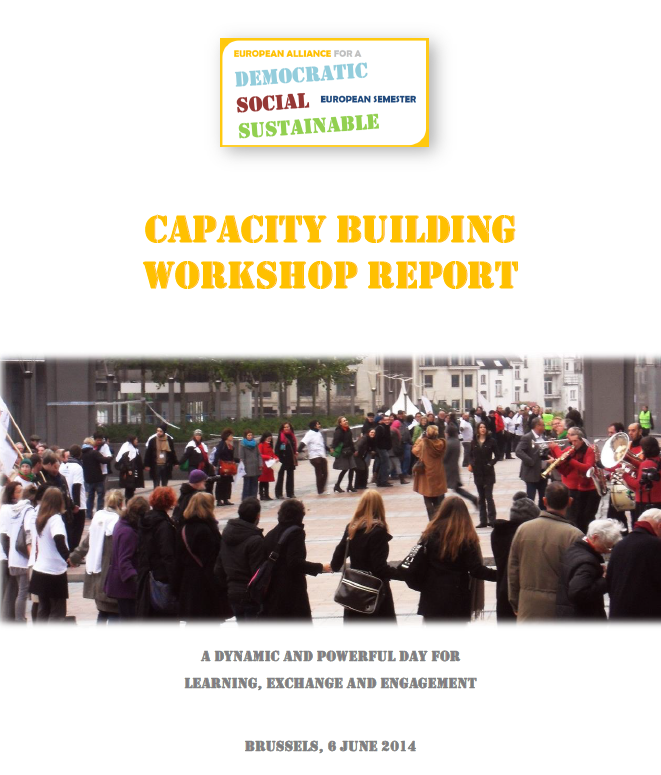 This capacity building workshop has been planned as part of the Alliance work programme to support its national and European members to engage more effectively and work together in the European Semester process. The event sent out a clear message of the need to raise awareness at the national level on Europe 2020 and the European Semester, to strengthen the effectiveness of stakeholder engagement at the EU and the national level, and to increase the involvement and ownership of the Semester Alliance.